SkinRenu creates and markets a line of advanced skin care products for mature skin that restore the natural health of your skin without the use of harsh substances or other aggressive methods of treatment. SkinRenu’s unique formula of Natural Active Lipids bathes the skin cell walls, improving communication and repair. Special formulas of natural antioxidants, botanicals, vitamins, minerals and peptides are added to correct specific skin conditions like eye wrinkles or thin skin. These natural nutrients and vitamins move to where your skin needs them the most, rebuilding your skin’s lipid layers and improving moisture retention. With continued use, SkinRenu products will get your skin back to a younger, healthier look with increased elasticity. Drying Lotion by SkinRenu for acne, pimples and blackheads is our most popular and effective solution to the problem of acne irritation. But the really great thing about our drying lotion is that as the pimples are being eliminated, essential lipids Omega 3 and Omega 6 are working at the cellular level to restore your skin to normal. It’s a system that can actually help speed-up the healing process! Drying Lotion by SkinRenu is proven to help minimize the swelling and irritation of minor acne, pimples and blackhead flare-ups, plus helps improve skin healing time. Our natural and non-irritating lotion will help rid skin of dead cells, speed healing and promote a smooth and clean appearance rapidly. With its mild antiseptic properties, Drying Lotion by SkinRenu also helps prevent additional infection. It’s power-packed with antioxidants from grape seed and olive extracts (superior to Vitamins C and E). These extracts reverse the signs of aging by regenerating skin damaged by the effects of sun exposure, making the skin more youthful in appearance and firm to the touch. As you age, decreased skin immunity affects the appearance and strength of your skin, causing wrinkles and a loss of firmness. Daily use of Ultra Antioxidant Formula by SkinRenu increases the skin’s immunity and ability to repair and regenerate itself. 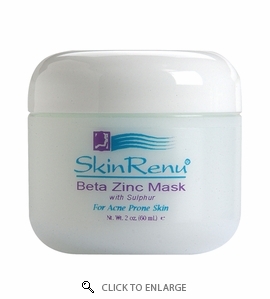 Beta Zinc Mask with Sulfur formulation by SkinRenu works very well for those with acne or rosacea prone skin. It contains adequate quantities of zinc and niacinamide that help to calm the skin. Beta Zinc Mask with Sulfur blends several ingredients for a synergistic strategy in the treatment of acne. Beta Zinc Mask by SkinRenu corrects the commonly found zinc deficiencies in acne prone skin. Zinc is an effective anti-inflammatory nutrient. Most importantly, Zinc helps reduce the androgenic excesses that are frequently found in adolescent’s skin. Another key ingredient, Sulfur, is a time-honored, mild antiseptic that will help manage troublesome bacteria. Beta Zinc Mask by SkinRenu absorbs excess oil, dries out, disinfects, and cleans the skin of dead cellular debris.